Houston, are we there yet? NASA is developing a variety of new safe and fast technologies to propel explorers across the solar system. September 9, 2002: "Mom, are we there yet?" Every parent has heard that cry from the back seat of the car. It usually begins about 15 minutes after the start of any family trip. Good thing we rarely travel more than a few hundred or a few thousand miles from home. But what if you were traveling to, say, Mars? Even at its closest approach to Earth every couple years, the red planet is always at least 35 million miles away. Six months there and six months back--at best. 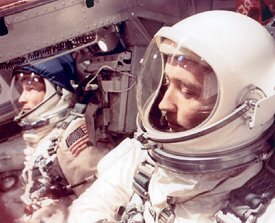 "Houston, are we there yet?" "Chemical rockets are just too slow," laments Les Johnson, manager for in-space transportation technologies at NASA's Marshall Space Flight Center. "They burn all their propellant at the beginning of a flight and then the spacecraft just coasts the rest of the way." Although spacecraft can be sped up by gravity assist--a celestial crack-the-whip around planets, such as the one around Saturn that flung Voyager 1 to the edge of the solar system--round-trip travel times between planets are still measured in years to decades. And a journey to the nearest star would take centuries if not millennia. Worse yet, chemical rockets are just too fuel-inefficient. Think of driving in a gas guzzler across a country with no gas stations. You'd have to carry boatloads of gas and not much else. In space missions, what you can carry on your trip that isn't fuel (or tanks for fuel) is called the payload mass--e.g., people, sensors, samplers, communications gear and food. Just as gas mileage is a useful figure of merit for the fuel efficiency of a car, the "payload mass fraction"--the ratio of a mission's payload mass to its total mass--is a useful figure of merit for the efficiency of propulsion systems. With today's chemical rockets, payload mass fraction is low. 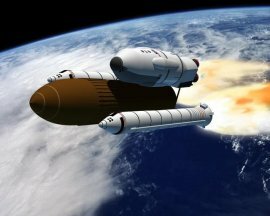 "Even using a minimum-energy trajectory to send a six-person crew from Earth to Mars, with chemical rockets alone the total launch mass would top 1,000 metric tons--of which some 90 percent would be fuel," said Bret G. Drake, manager for space launch analysis and integration at Johnson Space Center. The fuel alone would weigh twice as much as the completed International Space Station. A single Mars expedition with today's chemical propulsion technology would require dozens of launches--most of which most would simply be launching chemical fuel. It's as if your 1-ton compact car needed 9 tons of gasoline to drive from New York City to San Francisco because it averaged only a mile per gallon. In other words, low-performance propulsion systems is one major reason why humans have not yet set foot on Mars. More efficient propulsion systems increase the payload mass fraction by giving better "gas mileage" in space. Since you don't need as much propellant, you can carry more stuff, go in a smaller vehicle, and/or get there faster and cheaper. "The key message is: we need advanced propulsion technologies to enable a low-cost mission to Mars," Drake declared. Thus, NASA is now developing ion drives, solar sails, and other exotic propulsion technologies that for decades have whooshed humans to other planets and stars--but only in the pages of science fiction. What are the science-fact options? NASA is hard at work on two basic approaches. The first is to develop radically new rockets that have an order-of-magnitude better fuel economy than chemical propulsion. The second is to develop "propellant-free" systems that are powered by resources abundant in the vacuum of deep space. All these technologies share one key characteristic: they start slowly, like the proverbial tortoise, but over time turn into a hare that actually wins a race to Mars--or wherever. They rely on the fact that a small continuous acceleration over months can ultimately propel a spacecraft far faster than one enormous initial kick followed by a long period of coasting. Above: This low-thrust spaceship (an artist's concept) is propelled by an ion engine and powered by solar electricity. Eventually the craft will pick up speed--a result of relentless acceleration--and race along at many miles per second. Image credit: John Frassanito & Associates, Inc.
Technically speaking, they're all systems with low thrust (meaning you would barely feel the oh-so-gentle acceleration, equivalent to that of the weight of a piece of paper lying on your palm) but long operating times. After months of continuing small acceleration, you'd be clipping along at many miles per second! In contrast, chemical propulsion systems are high thrust and short operating times. You're crushed back into the seat cushions while the engines are firing, but only briefly. After that the tank is empty. "A rocket is anything that throws something overboard to propel itself forward," Johnson pointed out. (Don't believe that definition? Sit on a skateboard with a high-pressure hose pointed one way, and you will be propelled in the opposite way). Leading candidates for the advanced rocket are variants of ion engines. In current ion engines, the propellant is a colorless, tasteless, odorless inert gas, such as xenon. The gas fills a magnet-ringed chamber through which runs an electron beam. The electrons strike the gaseous atoms, knocking away an outer electron and turning neutral atoms into positively-charged ions. Electrified grids with many holes (15,000 in today's versions) focus the ions toward the spaceship's exhaust. 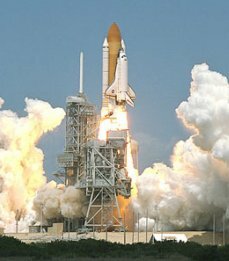 The ions shoot past the grids at speeds of up to more than 100,000 miles per hour (compare that to an Indianapolis 500 racecar at 225 mph)--accelerating out the engine into space, so producing thrust. Right: The inner workings of an ion engine. Credit: JPL's Space Place. Where does the electricity come from to ionize the gas and charge the engine? Either from solar panels (so-called solar electric propulsion) or from fission or fusion (so-called nuclear electric propulsion). Solar electric propulsion engines would be most effective for robotic missions between the sun and Mars, and nuclear electric propulsion for robotic missions beyond Mars where sunlight is weak or for human missions where speed is of the essence. Ion drives work. They've proven their mettle not only in tests on Earth, but in working spacecraft--the best-known being Deep Space 1, a small technology-testing mission powered by solar electric propulsion that flew by and took pictures of Comet Borrelly in September, 2001. Ion drives like the one that propelled Deep Space 1 are about 10 times as efficient as chemical rockets. The lowest-mass propulsion systems, however, may be those that carry no on-board propellant at all. In fact, they're not even rockets. Instead, in true pioneer style, they "live off the land"--relying for energy on natural resources abundant in space, much as pioneers of yore relied for food on trapping animals and finding roots and berries on the frontier. The two leading candidates are solar sails and plasma sails. Although the effect is similar, the operating mechanisms are very different. A solar sail consists of an enormous area of gossamer, highly reflective material that is unfurled in deep space to capture light from the sun (or from a microwave or laser beam from Earth). For very ambitious missions, sails could range up to many square kilometers in area. Solar sails take advantage of the fact that solar photons, although having no mass, do have momentum--several micronewtons (about the weight of a coin) per square meter at the distance of Earth. This gentle radiation pressure will slowly but surely accelerate the sail and its payload away from the sun, reaching speeds of up to 150,000 miles per hour, or more than 40 miles per second. A common misconception is that solar sails catch the solar wind, a stream of energetic electrons and protons that boil away from the Sun's outer atmosphere. Not so. Solar sails get their momentum from sunlight itself. It is possible, however, to tap the momentum of the solar wind using so-called "plasma sails." Of course, the original, tried-and-true propellant-free technology is gravity assist. When a spacecraft swings by a planet, it can steal some of the planet's orbital momentum. This hardly makes a difference to a massive planet, but it can impressively boost the velocity of a spacecraft. For example, when Galileo swung by Earth in 1990, the speed of the spacecraft increased by 11,620 mph; meanwhile Earth slowed down in its orbit by an amount less than 5 billionths of an inch per year. Such gravity assists are valuable in supplementing any form of propulsion system. Okay, now that you've zipping through interplanetary space, how do you slow down at your destination enough to go into a parking orbit and prepare for landing? With chemical propulsion, the usual technique is to fire retrorockets--once again, requiring large masses of onboard fuel. A far more economical option is promised by aerocapture--braking the spacecraft by friction with the destination planet's own atmosphere. The trick, of course, is not to let a high-speed interplanetary spacecraft burn up. But NASA scientists feel that, with an appropriately designed heat shield, it would be possible for many missions to be captured into orbit around a destination planet with just one pass through its upper atmosphere. "No single propulsion technology will do everything for everybody," Johnson cautioned. Indeed, solar sails and plasma sails would likely be useful primarily for propelling cargo rather than humans from Earth to Mars, because "it takes too long for those technologies to get up to escape velocity," Drake added. Nonetheless, a hybrid of several technologies could prove to be very economical indeed in getting a manned mission to Mars. In fact, a combination of chemical propulsion, ion propulsion, and aerocapture could reduce the launch mass of a 6-person Mars mission to below 450 metric tons (requiring only six launches)--less than half that attainable with chemical propulsion alone. Below A hybrid-technology Mars mission begins with chemical propulsion to low-Earth orbit. Image credit: John Frassanito & Associates, Inc. Such a hybrid mission might go like this: Chemical rockets, as usual, would get the spacecraft off the ground. Once in low-Earth orbit, ion drive modules would ignite, or ground controllers might deploy a solar or plasma sail. For 6 to 12 months, the spaceship--temporarily unmanned to avoid exposing the crew to large doses of radiation in Earth's Van Allen radiation belts--would spiral away, gradually accelerating up to a final high Earth-departure orbit. The crew would then be ferried out to the Mars vehicle in a high-speed taxi; a small chemical stage would then kick the vehicle up to escape velocity, and it would head onward to Mars. As Earth and Mars revolve in their respective orbits, the relative geometry between the two planets is constantly changing. Although launch opportunities to Mars occur every 26 months, the optimal alignments for the cheapest, fastest possible trips happen every 15 years--the next one coming in 2018. Perhaps by then we'll have a different answer to the question, "Houston, are we there yet?" When will we be able to travel to distant stars as easily as in science fiction stories? Find out from Mark Millis of the Breakthrough Propulsion Physics Project at NASA's Glenn Research Center. Hitching a Ride on a Magnetic Bubble -- (Science@NASA) Scientists from the University of Washington and NASA are experimenting with miniature magnetospheres as an innovative form of space transportation. The Indefatigable Ions of Space Transportation -- (Science@NASA) After a successful test during NASA's Deep Space 1 mission, scientists say ion propulsion is here to stay. Right: Dr. Marc Rayman, project manager of NASA's Deep Space 1 mission, demonstrates the force applied by an ion engine--equivalent to the weight of a piece of paper resting on your hand. See also "A Gentle Push All the Way to the Stars" from JPL's SpacePlace. 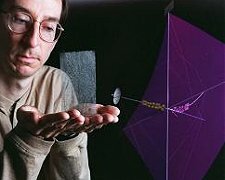 Setting Sail for the Stars -- (Science@NASA) Scientists met recently to discuss the latest developments in solar sail technology, which could carry a spacecraft beyond the edge of the solar system by 2018. See also, Solar Sailing 101. Where's the Edge? -- (Science@NASA) NASA's Advanced Space Transportation Program looks at ways to turn science fiction into reality.